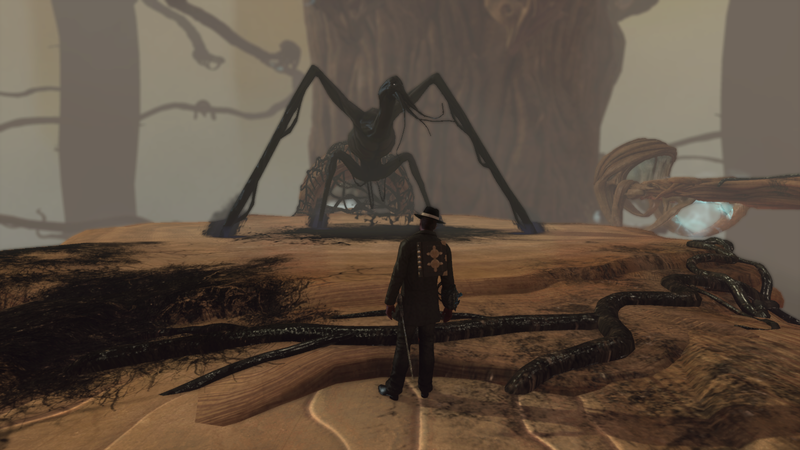 After many months of grinding and battling, The Secret World’s Whispering Tide world event seems to finally be drawing to a close. All previous missions are being offered one last time for those who may have missed some, and after May 21, the event will end. Hopefully, this means that the release of Tokyo is imminent, but before we get caught up in stomping Filthbots and flirting with Japanese rockabilly dudes, this seems like a good opportunity to look back at the Whispering Tide. I was very excited when the event was first announced. An epic world event featuring the most sacred sanctuary of Gaia being defiled by the Filth? Sounds badass. But, unfortunately, it didn’t quite turn out to be what I’d hoped. The event began with gathering crafting materials to support the custodian who would then unlock the main activity. This set the pattern for all stages of the Whispering Tide — gather materials to open a portal, then do stuff in said portal. Many have complained about this rather massive resource dump, but it doesn’t bother me. I wasn’t using my mats for anything anyway, and scenarios are an incredibly good way to farm, so it doesn’t take long to replenish your stores. Besides, it’s not like anyone forced people to dump all of their resources. The first portal led to a brief dungeon that could easily be soloed by most any QL10 player. This was my favourite part of the event, on the whole. It only took about ten minutes to finish a run, and the cooldown was so short that you could grind to your heart’s content. It was great to be able to log on and knock out a quick run whenever I had a few spare minutes. I really wish MMOs had more of these kind of quick, moderately challenging solo dungeons. I enjoy low-stress, bite-sized content like that. It’s very relaxing. Scenarios are similar, but their hectic nature isn’t very conducive to relaxation, even if you can easily get platinum, as I can. Stage one also introduced us to the Tendrils of Dis, Filth tentacles around the entrance to the portal that would slowly die off as players completed the mission. When all tentacles died, the next phase would start. The second phase followed the natural escalation of the MMO and featured a dungeon tuned around a five person group. This worked out better than it could have. 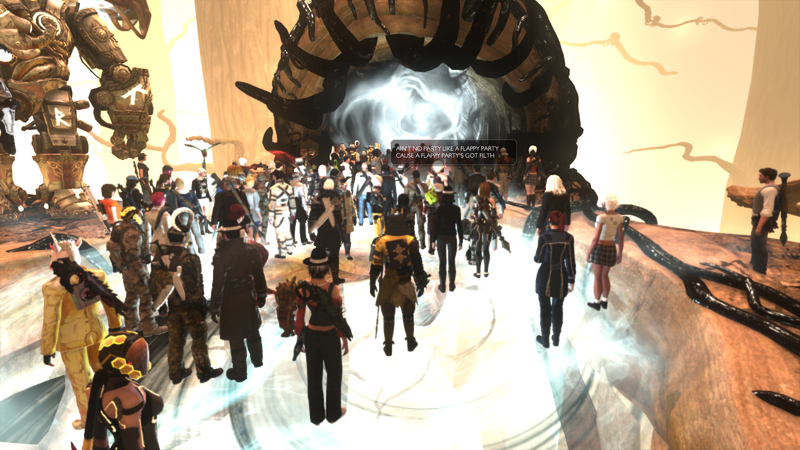 The low difficulty meant that pretty much anyone could do it, and it was relatively easy to find groups at all hours despite TSW’s archaic lack of a dungeon finder. It was also nice to have a low difficulty dungeon to use to test new or unusual builds. My main problem with this phase was that the rewards felt very disproportionate to the effort. The amount of currency received for each run was so pitiful that it was often hard to convince myself it was worth the effort of assembling a group and going through the whole dungeon, especially since there were occasional issues where certain members of a group wouldn’t received credit for defeating the last boss. It was also around this time that Funcom upped the cost of the most expensive event reward, the Runic Automaton pet. I never wanted the pet myself, so it didn’t affect me, but I fully sympathize with all the rage this generated. Upping the cost of an already extremely difficult to obtain reward is just Not Cool. Players need to have stable goals to reach for — moving the goal posts like this is never, ever okay in a live game. This phase also further exposed the problem posed by the Tendrils of Dis. You can’t have player actions determine when an event will end if the following content isn’t ready yet. So Funcom wound up tuning the health of the Tendrils such that players had no hope in Hell of killing them all in anything approaching a reasonable amount of time. Then, when the next phase was ready, they’d just turn up the death rate. Essentially, the player direction of this event became nothing but an illusion, and a very poor one at that. Ultimately, the mistake was attempting to let players determine the end of each of phase in the first place. That just wasn’t ever going to work. The final phase took things to their logical conclusion: a massive raid against the Bird of the Zero Point Pathogen, better known to fans as Flappy the Filth Dragon, who had been dive-bombing us in the previous dungeons and on the main branches of Agartha for months. At first, I strongly disliked Flappy. The fight was excruciatingly long, plagued by exploiting players who would simply go AFK and collect free rewards, and surprisingly laggy despite having been designed to create less lag than the previous world bosses. Furthermore, the attempt to create a more challenging yet still accessible world boss led to utter anarchy and near-constant deaths throughout the fight, even for those of us in survival builds. It grew wearing. However, to Funcom’s credit, they took fan feedback to heart and worked quickly to address many of the issues. A health nerf and a simple but effective system to discourage AFKers greatly cut down on the length of the fight. Once it was no longer a twenty minute plus endurance test, I came to appreciate the positives of the Flappy fight. The most interesting thing about the raid was how chaotic it felt, even if that was a double-edged sword. Between the dozens of players, the hordes of adds, and Zuberi’s assistance, it had a truly epic feel that few other MMO encounters have equaled. This wasn’t just a battle. It was a war. 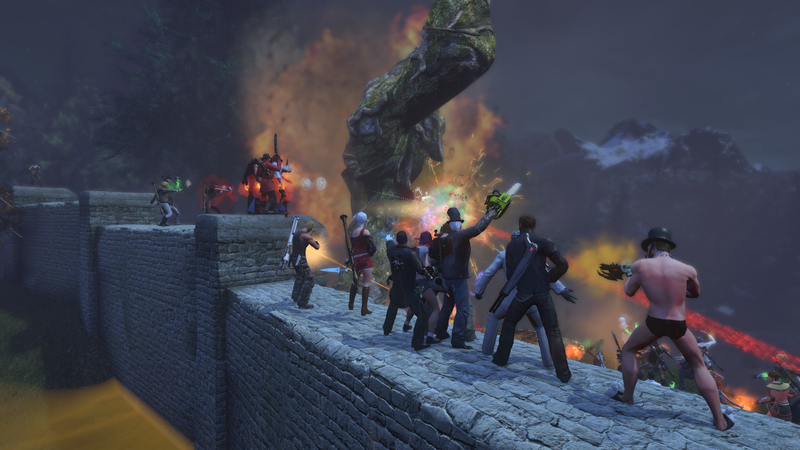 Funcom also deserves a lot of credit for bringing back forty-man raiding in a way that is casual friendly and doesn’t present any significant logistical hurdle. That’s no small feat. But the way the fight is scheduled to only be available for a limited time every three hours ensured you could always get a full group, and the ability to essentially corpse zerg the fight means group organization doesn’t really matter. Just run in and get killing. Yet at the same time, there are ways in which small groups of well-organized players can make a big difference — by taking out the mini-boss on the upper platform, for instance — so it also holds appeal for players who want more than a mindless zerg. Probably the best thing about Flappy was its rewards system, which was miles ahead of previous world bosses. The fact that every kill rewards a decent amount of both event currencies gave a buffer against bad luck. No matter how unlucky you were with drops from his loot bag, you were guaranteed to get something good from the vendors if you put in the hours.The loot bag itself was also nicely rewarding. You could still get lame rewards like potions, but at least there weren’t any of those thrice-damned, utterly useless flairs we were showered with in past events. The fight still had issues, though. Even with the health nerf and other changes, it was still a little too long for my taste. Given how hectic it is, it starts to feel like a stress test for my keyboard after the ten minute mark or so. There was far too much potential to die through no fault of your own. If the tank loses aggro and Flappy spins on you just as he’s casting Membranous Tempest, or if someone kites Filth Exposure into a crowd on the upper platform, you’re going to die, and there’s absolutely nothing you can do about it. Overall, there was just too much going on in the fight. Finally, the lag was distressing. I rarely if ever lagged on the other world bosses, yet despite the fact Flappy was designed to minimize lag, there was still usually at least moment per fight where the game slowed to a slide show. My favourite event bosses to date remain the original anniversary golems. …Why the Hell does Firefox’s spell checker have “rockabilly” but not “golems”? I think my biggest disappointment about the Whispering Tide is that it just never lived up to its own fantasy. It never felt like an invasion. Agartha remained safe and happy, occasional bombing runs by Flappy aside, the whole way through. 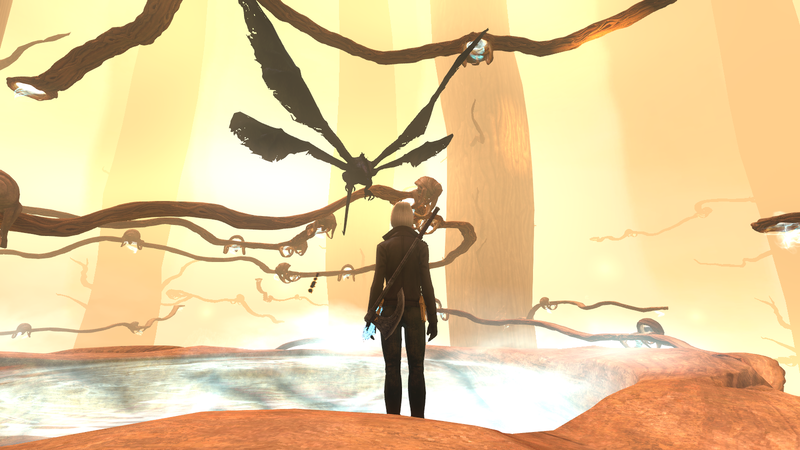 Never did I get the sense that Agartha was under real threat. This is a problem with MMOs in general. Villains just sit in their layers and wait to be killed. Why can’t the monsters come and raid us for once? That’s another thing the anniversary event did so well. Few things in my MMO career have felt as epic as seeing dozens of players man the walls of Harbaburesti to fend off a golem attack. I guess they didn’t want to disrupt player travel too much, but at the very least, why couldn’t the fights take place in an instanced version of the main platform? When the event was announced, I pictured players fending off waves of infected in a desperate final stand by the city portals. Couple that with various other stumbles, and Whispering Tide was fairly disappointing.I don’t think MMO developers should ever be discouraged from trying new things, so I don’t regret that they tried. But, in retrospect, I’d consider this a failed experiment, though there are elements that were fun and could be adapted to future content. I wouldn’t mind seeing a permanent, casual-friendly raid in the style of Flappy. Just hopefully not so long. I didn’t hate the Whispering Tide. It wasn’t bad for the game. It just wasn’t what I’d hoped. As an aside, I’m starting to wonder if the entire concept of MMOs presenting evolving and dynamic worlds is fundamentally flawed. I’ve yet to see it executed in a manner that lives up to the fantasy and isn’t more trouble than it’s worth — let’s not even get into the train wreck that is Guild Wars 2’s Living Story. The only positive example I can think of off the top of my head is the destruction of the Vale in World of Warcraft, and that was largely just a cosmetic change.